What is Kathak? Kathak is a very well known and important, classical Indian dance form of North India. The term “Kathak” is derived from the word ‘Katha’ or “story telling”. If we were to trace the origin of this beautiful and elegant dance, we would go back to the times of ancient India when nomadic bards or ‘Kathakars’ travelled between different villages, reciting and performing tales from mythology & the scriptures. Usually, these performances were accompanied by live music, dance, dramatic facial expressions, hand gestures and acts of mime. Some of the most popular themes included Radha, Krishna, Shiva, Parvati as well as scenes from daily life and historical events. When the Mughals came to India, this art form found a place in the King’s courts. Hence, with time, Kathak became a significant form of entertainment (and was called “Nautch”) instead of just pure devotion. From then on, the Kathak dance form started getting its true structure, evolving through the years. What began as a solo dance performance later diversified into group performances by troupe of Kathak dancers. Today, Kathak is recognized as a graceful, and elegant dance which can be performed by men and women. The two main techniques of this dance include “Nritya” or “pure dance” and “Abhinaya” or “emotions and expressions”. What is truly spectacular about Kathak is the manner in which it provides the dancer opportunities for improvisation and innovation. Kathak and Its Gharanas: The three main gharanas of the Kathak Dance are – Lucknow Gharana, Jaipur Gharana and Varanasi Gharana. These gharanas have played an important role in reviving this beautiful dance form. 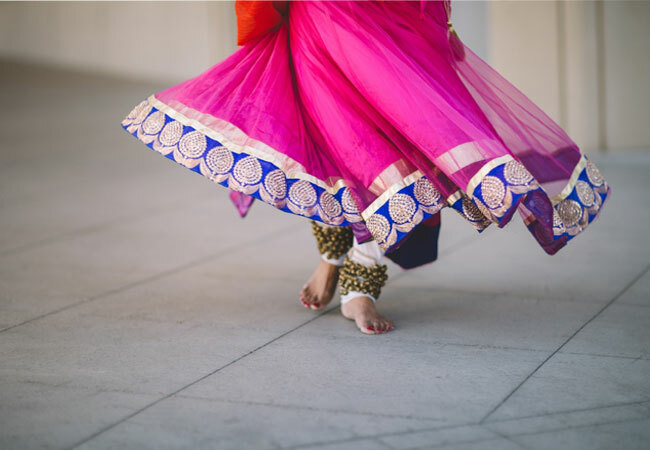 In the beginning, most female Kathak dancers wore a long skirt or the ghagra accompanied by a blouse or choli and a veil or dupatta. However, after the Mughal influence, the long skirt and blouse were replaced with the churidar kameez combination – churidar or tight pants and a long flowing kameez or angrakha which was tight fitting above the waistline and loose and flowing, waist down. Male Kathak dancers usually wear the Kurta and churidar or pyjama. Optional items include the cap, bandi, etc. The Kathak costume is incomplete without the all-important ghungroos or the ankle bells. As the dancer moves his/her feet to the sounds of the Tabla, the ghungroos add their beautiful melody, adding a special charm to the Kathak performance. Some of the other ornaments worn by the Kathak dancer include the maang tika, beautiful and attractive gold and silver ornaments for the various parts of the body such as the head, neck, hands, fingers, waist and feet. During the Kathak performance, there may be vocal or instrumental music of the Tabla and Harmonium.